Discovered by by British-Australian astronomer Robert H. McNaught via a CCD image on August 7, 2006. The discovery was made during the Siding Spring Survey searching for Near Earth Object threats. The comet was tracked for the rest of the year although not managing naked eye visibility until the new year. After the comet was lost in the sun’s glare, it re-emerged having brightened very rapidly reaching naked-eye visibility for Southern sky observers in early January 2007. The comet reached perihelion on January 12, 2007 with a close approach to the sun of 0.17AU. This was close enough to be viewed in SOHO’s LASCO 3 camera for all to see online. On January 13-14, the comet reached a dazzling brightness of -5.5 making it the brightest comet for over 40 years. Its tail reached an impressive 35 degrees in length. 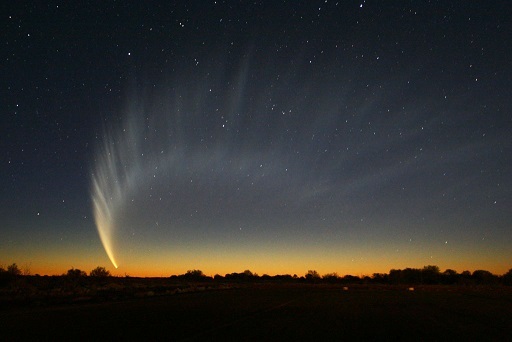 The tail developed in to a huge fan shape in the Southern twilight sky. From 44 degrees north latitude, I saw McNaught on 3 separate evenings, Jan. 7, 10 and 12 of 2007.